Bus bombing on Egyptian side of Israel-Egypt border crossing kills four, injures 15. Islamist terrorists suspected. 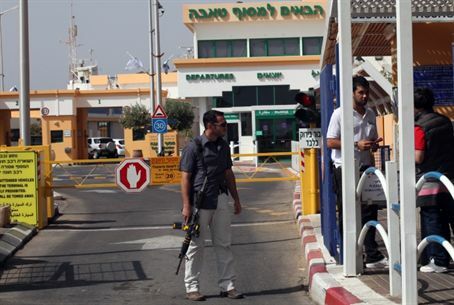 An explosion was heard Sunday afternoon at the Taba crossing between Israel and Egypt, south of Eilat. The blast occurred on the Egyptian side of the border. According to initial reports, there was an explosion on a bus. The Egyptian interior ministry reported that at least three Korean tourists and the Egyptian driver of the bus were killed, and another 15 wounded. First responders are at the scene. According to the Bethlehem-based Maan news, Egyptian soldiers have sealed the exits to Taba in an attempt to locate the attackers. Egyptian soldiers have been fighting terrorists in the Sinai Peninsula over the last several months. Terrorists have successfully carried out several mass-casualty attacks in the area. Islamist terrorists are the prime suspects in the latest attack as well, which took place as deposed Islamist Egyptian president Mohammed Morsi stood trial in Egypt.